COUNT DRACULA Blu-ray Release Party! 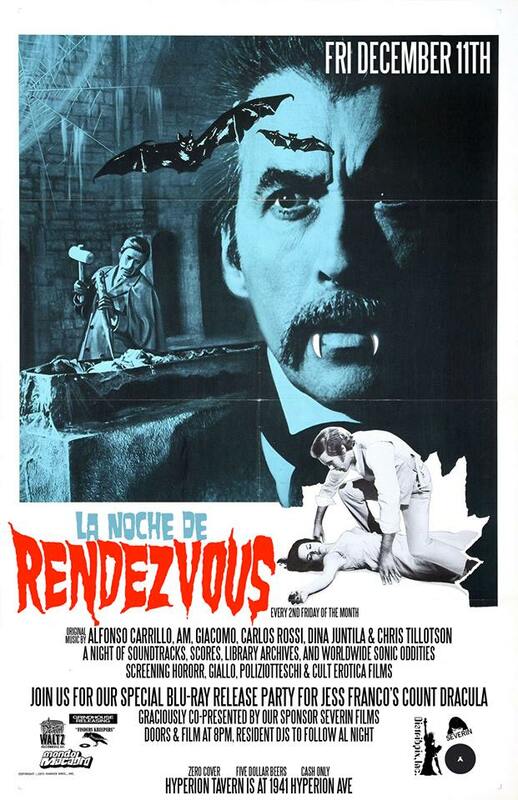 RENDEZVOUS & Severin Films Present COUNT DRACULA Blu-ray Release Party! RENDEZVOUS & Severin Films are proud to present the blu-ray release party for Jess Franco’s rendition of the Bram Stoker classic, COUNT DRACULA! Join us at the Hyperion Tavern in Los Angeles on Friday, December 11th for a FREE screening of COUNT DRACULA (starring Sir Christopher Lee, Soledad Miranda, and Klaus Kinski) at 8PM. In typical RENDEZVOUS fashion, we will have LOTS of surprises and exclusives on hand…all to be announced! Immediately following the film, the RENDEZVOUS crew will be spinning all sorts of soundtrack and library goodness, including selections from the COUNT DRACULA OST by Bruno Nicolai! Finally, last but DEFINITELY not least, our resident RENDEZVOUS film archivist, Jim Branscome, will be screening a specially crafted highlight reel showcasing an array of Dracula delightfulness. This will be our our last party of 2015 and we are looking forward to closing out this amazing year with a bang! See you there!! Severin Films, Mondo Macabro, and Grindhouse Releasing merch for sale! !